If you need to lower the AC input voltage to keep your power-transformer cooler and you want to drop it back down to 110v or 115v or whichever then try two zener diodes back to back in series. Choose whatever value you need to drop 15v or 12v or whatever. I easily knocked my 125vac back down to 112vac by adding two 12v zeners in the AC supply side to the primary. I didn't bother to calculate wattage carefully, just selected 5 watts for safety. Compared to a 12volt bucking transformer... this is a simple 60 cent solution?? It works here for me... with a nice clean-looking sine-wave shape for the modified waveform too. Interesting idea, Peter. Incidentally, since the diodes won't conduct until the line voltage reaches 12 volts, I would expect a flat zone in the AC waveform at each zero-crossing. Not that that would cause any problems, but I'm curious that you observe a nice clean sine wave. Do you heat-sink these diodes at all? If the radio draws 50 watts, that's roughly half an amp from the line. Each diode is in its back-bias region (i.e., "zenering") for half of the sine wave, and so it sees about 1/4 amp average. And 1/4 amp at 12 volts is 3 watts, so a 5-watt diode is a good choice. I've probably screwed up the RMS-vs-average question here, but they point is, they may need a little heatsinking. Have you observed that they run warm? Finally, is the postage from the UK reasonable? I posted under another thread on this. It will work but no better than a wire wound resistor. The Zeners still have to dissipate the same amount of heat. In some ways a resistor gives better regulation. A resistor does a better job reducing voltage when current goes up. Sort of regulates. A Zener regulates voltage across the device but does the opposite when something is in series. A setup with 2 - 12 volt Zeners will drop the line 12 volts regardless of input voltage. A resistor drops more as line voltage increases. I wonder if the zeners cause any RF noise? You get a flat spot near zero-crossing, then suddenly jump to 12V with a fairly sharp rise time. A resistor wouldn't have that problem. The zeners will generate RF noise. Back biased (IE: Normal operating mode) zeners are routinely used for "white noise" generators. Perhaps a bypass cap across the pair would take care of this. I'm sure you can buy 5 watt zeners somewhere in the UK cheap too..no? I didn't have a 5 watt zener here but bunches of 1 watt diodes. So I actually used two sets of five 1-watt diodes in parallel for my quickie test. I'd maybe try 7 or 10 watt diodes before a heat sink based on price.. Yes Bill, I do see the flat crossover that you refer to... Sure...but what I meant is that the rest of the sine wave is clean an free of any noise. I haven't run a temp test yet. Well, no. Sounds like you are confusing it with an SCR or some similar device. Think of it this way, if the zener voltage is exactly 12 volts, then the flat spot (no conduction) will last until the line voltage rises to exactly 12 volts. Then, when the line voltage rises a bit more - to, say, 12.01 volts - the voltage to the transformer will rise by the same amount, to 0.01 volts. When the line voltage rises to 12.02 volts, the voltage to the transformer will rise to 0.02 volts. The sine wave is perfecty reproduced, but each half is simply lowered by 12 volts. There are no snappy edges. As long as I'm saying NO NO NO, I'm not sure I agree with the idea that a resistor would be better because of its voltage-regulating effect. If the radio has a Class-A audio stage, you might be able to make this argument. But if it is Class-B, so that the line current varies with audio volume, the bouncing power supply voltage will distort the audio, and who knows what else. The radio expects a "stiff" voltage - one that is constant and does not vary on a millisecond-by-millisecond basis. Just my thoughts. All in all, I think it is an interesting approach. I guess I should ask that if zeners are so wunnerful wunnerful why havent they been promoted for that use for many decades? After all its not rocket science. Where is the evil lurking in this idea? I'll get a few 5-10W from Mouser on my next order and run some bench tests. The only lower voltage ones I have here at the time are 50 watters. A Zener used like has the opposite effect of regulation. 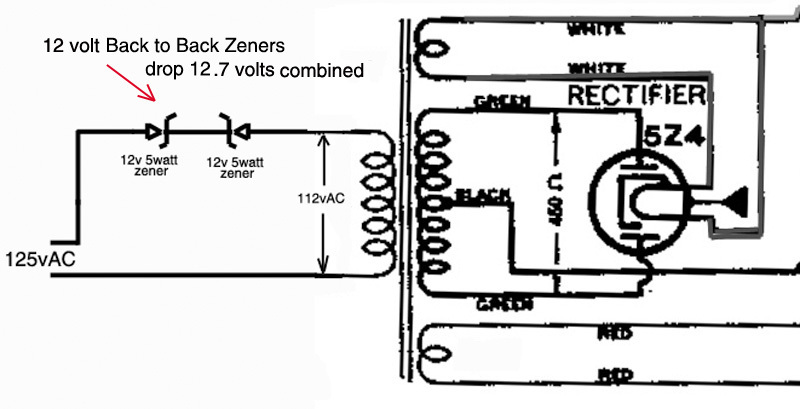 Zener diodes regulate voltage in parallel. In series there is more voltage variation. Look at it this way.. A 100 volt Zener in series with a 100 volt AC allows no voltage to a radio. If the line voltage increases to 125 volts the radio gets 25 volts. Using a Zener like this a radio will only see the variations. The sine wave is perfecty reproduced, but each half is simply lowered by 12 volts. There are no snappy edges. May not be any snappy edges, but there is also no voltage on the transformer for a 50 or 100 microseconds at the beginning and end of each sine pulse. So it's not a "perfect sine" wave. If I have time, I will try this and take a scope photo. I hooked up a small transformer and two twelve volt zeners. Used my iso and variac and didn't run up to full line voltage. At reasonable loads, you get a flat spot in the line voltage and the transformer voltage is 8.5V RMS less than without the zeners (12 V zener divided by 1.414). At very light load, all I saw was a little "glitch" at about 12V on the sine wave. You're right, Rich, I was sloppy in my phrasing. What I intended to say was that the part of the sine wave that is above the zener threshold is reproduced perfectly. Obviously the part of the sine wave that is below the zener threshold isn't reproduced at all - that's the flat spot we've been talking about.